Except as otherwise noted, all material on this website is copyright, 1997 to 2015. Park Bridge, located just south of Drumoak, is a fine Grade A li sted building, dating from 1854. 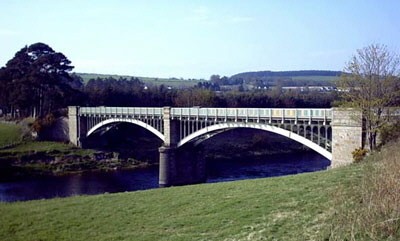 The Railway Company, with the prime purpose of allowing residents from the south side of Dee to use the trains, constructed this bridge and the road connecting Park Station (at Drumoak) to the South Deeside Road. After crossing the Dee via this attractive bridge with three granite pillars and two graceful cast iron arches, the road on the Durris side is constructed like a railway with embankments and cuttin gs, rather than following the normal lie of the land. The bridge is believed still to be surfaced with wooden railway sleepers, albeit covered in tarmac. In this newpaper clipping, the old metal railings can be seen. The cut-outs for these railings can still be seen on the granite pillars today. 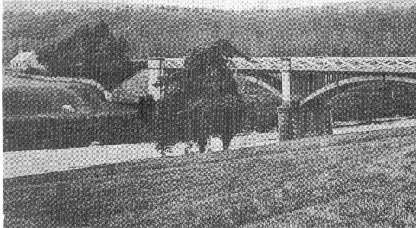 As both road and bridge were private property, the Railway Company charged a toll. This was still being charged by British Railways into the 1950s, when the cost per car was 3d (1.2p). The former tollhouse is located just north of the bridge. The engineer was John Willett. 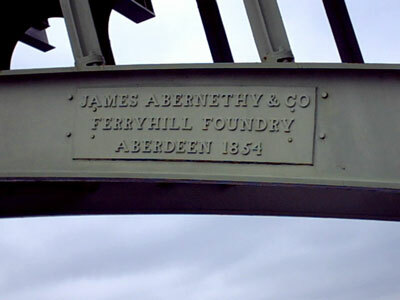 The ribs were cast locally by ironfounder James Abernethy (DM), as can be seen from the metal plate only on the south-west rib.